Discussion in 'Baja Bytes By Gary Graham' started by Baja Bytes, Dec 18, 2017. 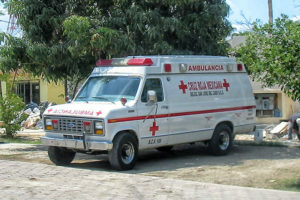 Medical insurance in Mexico, tourist? I’ve had friends who were injured or became ill in Mexico and had big problems with payment for either getting in to see a doctor, or getting out of the hospital. it was something that would never happen to me. Now, I’ve been around long enough to see the value in having coverage. The weather side of North Island is still producing some quality bonito with an occasional small yellowtail to spice things up. Also, a few fish are still breezing at the Middle Grounds early in the morning and late in the afternoon. Still a few calicos at SKR and farther down at the Rockpile expect mostly sheepshead, lingcod, reds, plus a variety of rockfish to fill the sack. The ones using whole frozen squid and the Ahi Assault Jig seemed to have the best results. While it is sloppy offshore, there are still a few kelp paddies if you can find them in the choppy conditions. A few boats scored on yellowtail in the 8 to 12-pound class when they could find a paddy. Sketchy at best, however, lots of fin bait still being seen in the area. Fishing in 50- to 125-feet of water produced rockfish on the bottom along with a few sand bass, plus a halibut or sheepshead. On the surface it was best for small, breezing yellows and bonito. In deeper water, anywhere from 150- to 300-feet and with slack current allowing a decent drift, resulted in some reds, bocaccio and chuckleheads. Some wind-chop made it difficult to locate the breezing bait with the bonito, barracuda and an occasional small yellowtail feeding on them, although the “run and gun” style of chasing the bird schools is always fun. 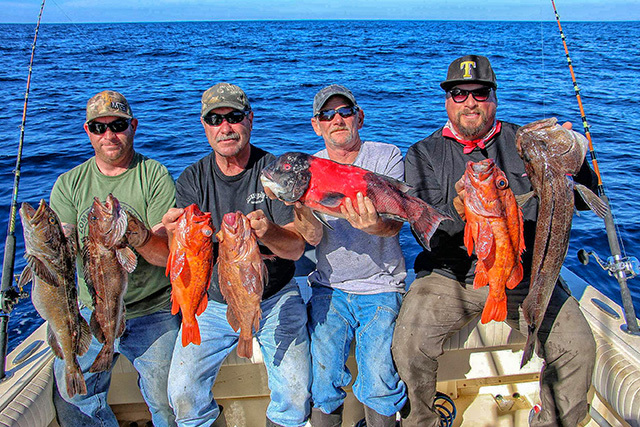 If the current allowed, the drifts over the drop-offs and pinnacles were rewarding, either with live bait, fresh dead squid, or yoyo style lures, producing a mixture of reds, rockfish and a few lingcod for the local panga fishing. If all else fails, try drifting over the sandy bottom areas for a halibut or two. Bryan Shary, Richard, Kenny and their buddy, another Bryan, all from Yucca Valley, caught near limits of a mixed bag of fish. While closer to the border, the seas have been rougher. Here, the weather has been fall-like with calm seas, little wind and still a warm, 64.5 degree sea temperature. Thankfully, there were ample small mackerel just outside the bay, and the high spots are loaded with red crab for bait. A few of the other local anglers took advantage of the late season action that refuses to quit as well. 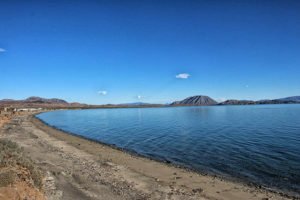 Despite dreadful North Winds farther down in the Sea of Cortez, visitors and locals alike are reporting ideal weather. Still, there are some whale sharks cavorting about. I would expect that it wouldn’t last too much longer. Few visitors, along with some local anglers, fishing recently, however, with the great weather have been enjoying some late season bottom fishing for grouper and snapper along with other rock dwellers. The winter winds that began last week have started into the normal pattern of a few days on and a few days off. Today’s North Winds blew again but decided to come out of the south and southwest. The boats that have gotten out this past week found a continuation of the good cabrilla bite all around the coastline of Coronado Island. Word had gotten out from the boats that took a chance on the long haul north to Pulpito found yellowtail are hitting mackerel at the high spots. 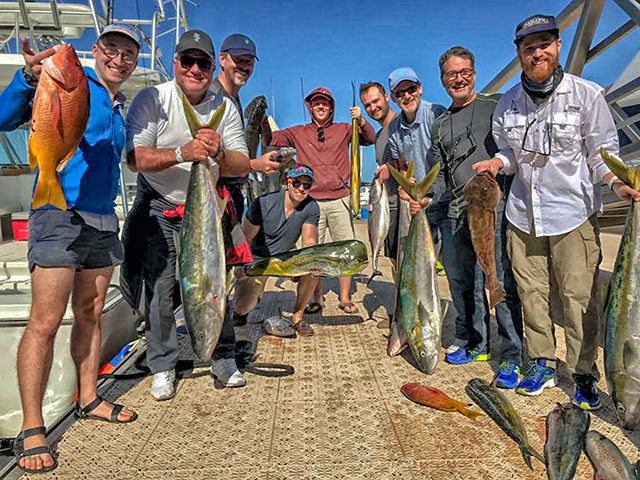 Yellowtail from 18 to 25 pounds filled a few fish boxes. The past month we have been seeing yellowtail of the smaller version, mostly around 10 pounds. Sardina and mackerel all point to a good winter season around Loreto. As the windy days settle down, more boats will want to adventure out farther to the other high spots to hook up with big yellows and assorted high spot neighbors. Island and scuba trips are happening with the influx of holiday travelers and it seems fishing is taking a back seat with these folks. Another month and we will be into the whale season. Several yachts traveling past reported that there were still striped marlin on their numbers from last year according to Captain Peter Groesbeck who just returned from a productive trip aboard “Controlled Chaos” to Puerto Vallarta. Winter has been settling in as air temps bounce between a low of 59 and a high of 74-degrees, along with about the same 74-degree sea temp. Much to the windsurfers delight, the North Winds have already made their presence known. Before the winds roared in, there were still a few billfish and yellowfin tuna along with a wahoo or two. For the sportfishing gang, it’s the time of year to take one day at a time. There has been no wind in the morning. Currently it’s … “let’s go fishing!” There are still a few of the dink dorado to play with not too far offshore, along with a few keepers for the lucky ones. Closer to shore, with weather permitting, the sierra are beginning to show. Just in time to provide ceviche, a Baja Christmas holiday favorite, coupled with fresh tortilla chips. This is now late in the season for warmer water gamefish such as yellowfin tuna, dorado and wahoo, although the sea temps remain in the 70s. The wahoo action slowed way down, with only a handful of these fish being landed recently. Dorado showed up in greater numbers … still varying from day to day … though many anglers have been able to catch their two-fish limit. Most of these fish were in the 5- to 15-pound range with an occasional fish to 20-pounds. 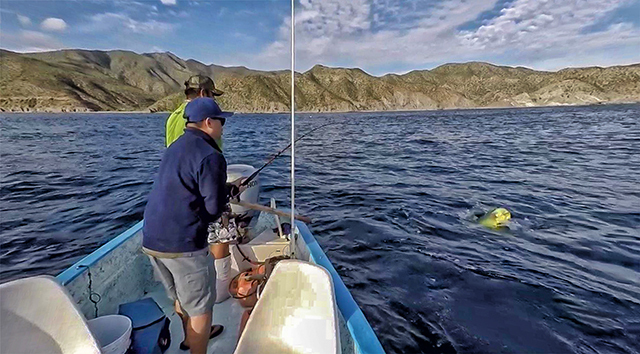 Remember to release juvenile female dorado whenever you have the opportunity; this is beneficial for the future fishery to maintain sustainable numbers. Yellowfin tuna were one of the more common fish being caught on most days, though numbers were fewer. Tuna were being found off the Arches near Cabo San Lucas, to Santa Maria, Palmilla, Punta Gorda, La Fortuna and Iman Bank. Sardina were slightly harder to find in recent days, with Palmilla Point being the area where the schooling baitfish were being netted. These were definitely needed for chances at catching the yellowfin, as very few were striking on squid strips or on trolled lures. Sizes of the tuna averaged 10- to 15-pounds, though a few larger ones up to 40 pounds were caught on the Iman Bank. Mixed in with the schools of yellowfin tuna were white skipjack, a bit smaller than most of the tuna, but good eating, not like the black skipjack which are normally only used for cut bait. Some early sierra are coming from near shore grounds, though no big quantities yet. Also, there were handfuls of smaller roosterfish caught. The billfish catching has slowed down recently due to variable water temperature changes; considerable cloudy conditions over the entire area plus windy conditions have caused a port closure day. 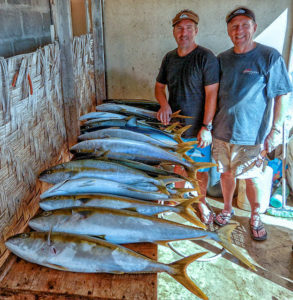 The yellowfin tuna being caught were mostly in the 50 to 55-pound range in a couple of areas, using the drifting method along with weighted live bait. Cabo Climate: Daytime temps averaged 78.1-degrees with nights at 66.1-degrees. The average humidity ratio has been at 69.1%. It has been mostly cloudy at land’s end but mid-December it was predicted to have about a 50% chance of scattered showers in the area. Sea Temps: Sea temps from the Finger Bank and southerly to the upper end of the Golden Gate Bank was all at 76 to 77-degrees. The Golden Gate Bank, down across the Jaime Bank and out across the 1,000 Fathom Curve are all at 77 to 79-degrees. San Cristobal and around to San Jose Del Cabo have been at 79.5-degrees, (including the Herradura, Cabo Falso, the 95 Fathom Spot, the 1150 Fathom Spot, as well as the Cabrillo Sea Mount … all were at 79.5-degrees). The Gorda Banks to Los Frailes, temperatures were at 78.5-degrees. Sea Conditions: Sea surface breezes flowing in mostly from the southwest direction averaged 6.1 mph. Overall, there have been no difficulties in traveling in any directions; although, the port was closed a day or two due to windy conditions. Best Fishing Areas: There have been no regular “Hot Spots” for the billfish action as billfish has been scattered about recently. Two of the billfish were caught and released in the Migrino area and the tuna were mostly a ‘time of day’ bite in the areas near Cabo Falso and on the bank close to the Gray Rock area, (Cabeza de Ballena). Best Bait-Lures: Live bait drifting was best for the yellowfin tuna and most of the dorado were taken on a mixture of artificials and rigged bait; the sierra were mostly taken on small shiny spoons and feathers in tight to the beaches. cortezpirasea, Tunahead and mulegemike like this. HAPPY HOLIDAYS AND BE SAFE EVERYONE! Glad to hear you are back on the road to recovery and online. Merry Christmas and a uneventful re-hab and Happy New Year.